Donald Trump's Department of Homeland Security says it will waive more than three dozen laws and regulations — most of them requiring environmental review — as it pushes ahead with the first phase of construction of an enhanced wall along the U.S.-Mexico border. The announcement Tuesday by the department's Customs and Border Protection Unit pertains to a 14-mile stretch of the wall in the San Diego area — stretching from the Pacific Ocean to a point inland known as Border Monument 251. President Trump issued an executive order in January for construction of the wall along the border. His administration says it can waive the environmental laws but opponents have already said the wall could be "catastrophic" to the environment and now charge that a waiver of further review is unconstitutional. An environmental group that has already called for more scrutiny of the construction said it believes its lawsuit previously filed over the construction will force enhanced review under the National Environmental Policy Act (NEPA) and a host of other laws. "Trump wants to scare people into letting him ignore the law and endanger wildlife and people," said Brian Segee, an attorney with the Center for Biological Diversity. "Trump's wall is a divisive symbol of fear and hatred, and it does real harm to the landscape and communities." 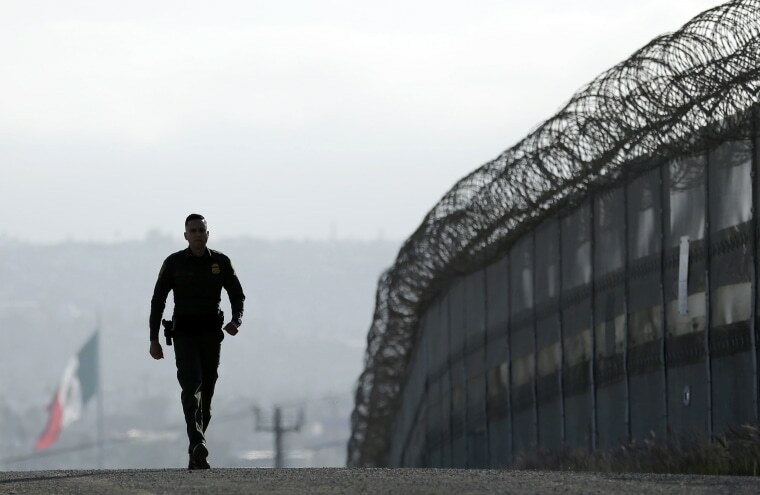 The announcement by DHS said the sections of the wall near San Diego could not go under construction in December, as planned, if the project was subjected to standard environmental review. Biological surveys required under federal environmental law would stretch into next June, according to the announcement of the waiver. Despite its attempt to waive NEPA and scores of other regulations — ranging from the Endangered Species Act, to the Clean Air Act and the National Trails System Act — Homeland Security still claimed in a statement that it would "implement sound environmental practices." The statement added that the CBP officials overseeing the work are "committed to the protection of the environment" and that they would "continue to perform all important surveys for biological and natural resources, wetlands, culturally significant sites, and environmentally sensitive areas." The announcement said the officials would coordinate with other federal, state and local stakeholders to assess the impact of the construction and "develop appropriate mitigation strategies." Those remarks did not reassure activists at the Center for Biological Diversity, which first sued in May to demand enhanced review of the wall. Joining the environmental group in the litigation was U.S. Rep. Raúl Grijalva, D-Ariz., the top Democrat on the House Committee on Natural Resources. The congressman added: "These are not minor regulatory requirements that DHS is circumventing. They are monumental protections that have been essential to preserving our country’s natural heritage and safeguarding public health." Environmentalists said the area targeted for initial construction in San Diego County includes wetlands, streams and other rare wildlife habitats that are the home of endangered species, including the Quino checkerspot butterfly and the California gnatcatcher, a bird. "This isn’t just a wall they’re in a rush to build. It’s roads, lighting and all of the infrastructure that comes with it. All of this without any environmental review or public input. It’s a travesty and it has to be stopped," Segee said in a statement. "We believe the waiver is unconstitutional, and we’re confident the courts will agree."